It's a disco down there! Jérôme Mallefet presents his photographs to colleagues onboard the RV Investigator. Bioluminescence is a chemical reaction within a living organism that results in the production of light, and in the depths of the abyss, this form of light is apparently more common than once thought. Indeed, it turns out that a surprisingly wide array of life in the depths can produce light. 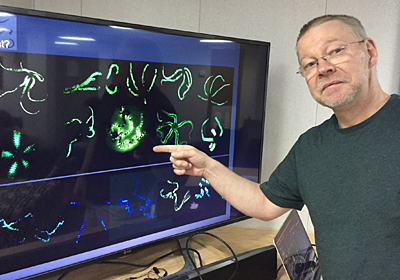 Jérôme Mallefet of the FNRS (National Science Foundation of Belgium) works at the University of Louvain-la-Neuve studying the occurrence of light producing animals in the deep sea. Jérôme wants to know how many organisms produce light, which patterns they display (color, intensity and duration of light), and which parts of their bodies the light is produced from. 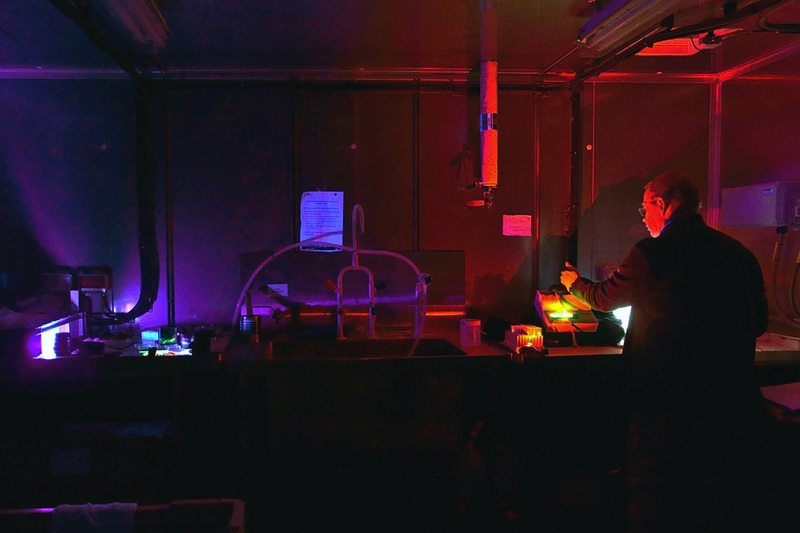 In a dark cold room on the CSIRO RV Investigator, he is photographing a glowing collection of marine life, including fish, tunicates, jellyfish, sea spiders, brittle stars, squid, sea stars and sea cucumbers. The results thus far are compiled in Jerome's video below. The function of bioluminescence in the twilight zone (200─1000 metres), where most of our knowledge comes from, falls into three main categories. It can act as an attractant, to bring food right to your mouth (as with the deep sea dragon fish or viperfish), as a repellent to scare, confuse, befuddle or reveal, and lastly for communication within a species (such as for mate attraction). 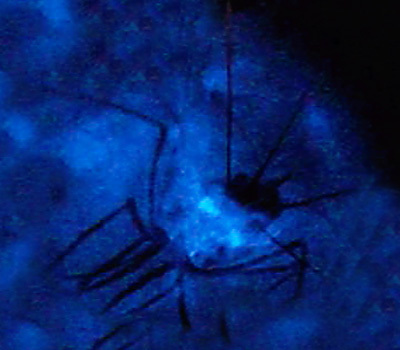 One species of deep sea shrimp has a very impressive example of a repellent strategy: it sprays a startling cloud of light at it's would-be attacker, before jetting off into the inky blackness. Still other fish use this in more subtle ways, by lining their underside with glowing lights to fool the predators that might be lurking below, making their underside blend in with the scant light that manages to filter down from above. Light from living organisms in the abyss is almost always a ghostly blue-green, as this is the wavelength on the colour spectrum that can travel the furthest underwater. 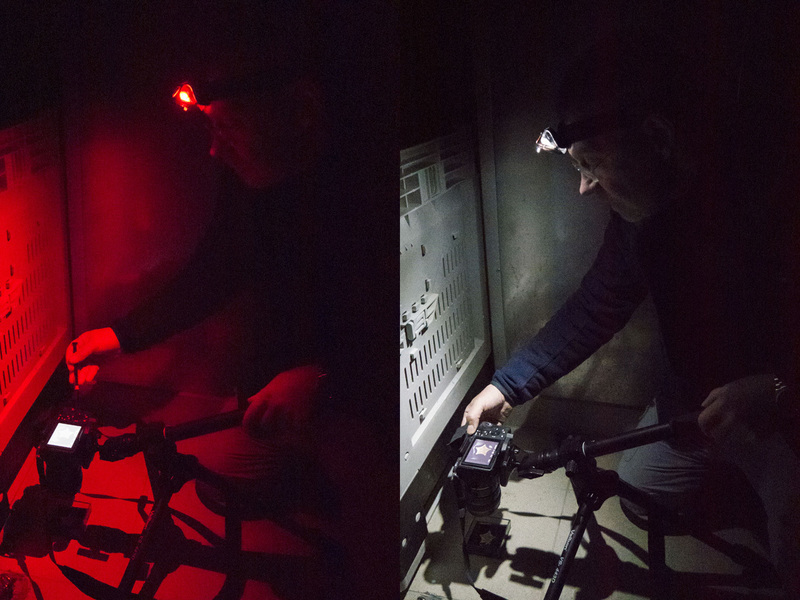 Blue light is found up to 1000 m down, while red light, for example, only manages to get about five or 10 meters before fizzling into nothingness. If I were inclined to enter the ocean wearing a bright red wetsuit and had the superhuman stamina to swim to a depth of 200 m, my wetsuit would slowly lose its colour with depth, until it eventually appeared dark brown. There are exceptions, however, to this colour exclusivity. 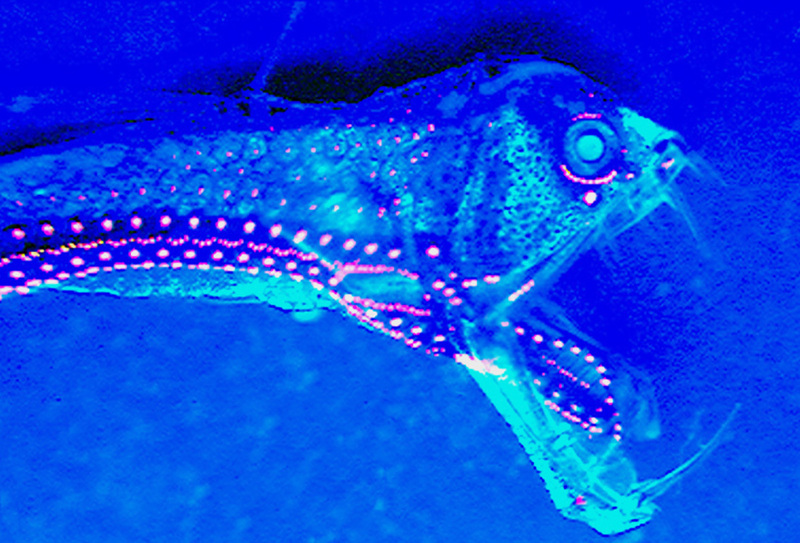 For example, the red dragon fish (mentioned in this previous blog post) produces red light in the deep blue depths to spot bright red crustaceans, invisible to all but the dragon fish's insidious search beam. The abyssal plain is still mostly a mystery to us, as it is rarely observed. Much of the work that has been done on light-producing species in the twilight zone may not apply to those in the deepest parts of the ocean. One thing we do know is that the seafloor is mostly very flat, and the water, free from the turbulence of the surface, surprisingly clear. This means that any light produced there may travel a long way in the black void. It is thought that some fish could have evolved sensitive eyes to try and spot any underwater flickers of light, but currently this is just guess work until more data come in. In other abyssal species, the eyes seem to have shrunk to tiny black dots, or disappeared altogether. Little by little we are illuminating dark mysteries of the abyss. The velvet belly lanternshark, Etmopterus spinax, is a bioluminescent deep-water species. It has a unique pattern of light-emitting photophores, some of which are thought to provide counter-illumination, camouflaging the shark against predators and prey. On the Investigator, Jérôme Mallefet is working in a dark cold room maintained at 6°C, keeping collected organisms in a dark box filled with very cold seawater (1°C). "I stay in the room so that my vision will be well adapted to the darkness before handling the animals," Jérôme says. "I then trigger the production of light (using a mechanical stimulus) and record the intensity of stimulated light using a highly sensitive instrument called a luminometer. I also try to capture images of luminescence with a sensitive camera. Later, in the laboratory, I take fixed or frozen tissues samples to study aspects such as the morphology and biochemistry of the animals."